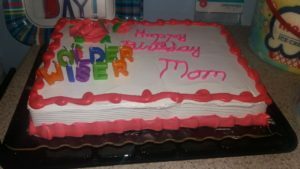 My 47th birthday was May 22. My daughters wanted me to spend the day with all of them at daughter Elizabeth’s house. When I walked in the house it was decorated with balloons and Happy Birthday banners. Soon after I was there all five of my sisters and some of my nieces drove in to spend the day with me. What a wonderful surprise! It is not often that all of us six sisters get to spend a day together. My daughters had invited them, and everyone brought food. Daughters Elizabeth and Susan made the casseroles. Daughter Verena had taken the cake, ice cream, etc. to Elizabeth’s house the day before. I’m not sure if I can remember all the food that was brought in but I’ll try. There was salad, deviled eggs, cheese, veggies and dip, chips, cookies, cinn-a-pan rolls, rhubarb cake dessert, jello with fruit, chocolate cake, brownies, Rice Krispy treats, rhubarb juice and Pepsi. Then we also had a white birthday cake and ice cream. 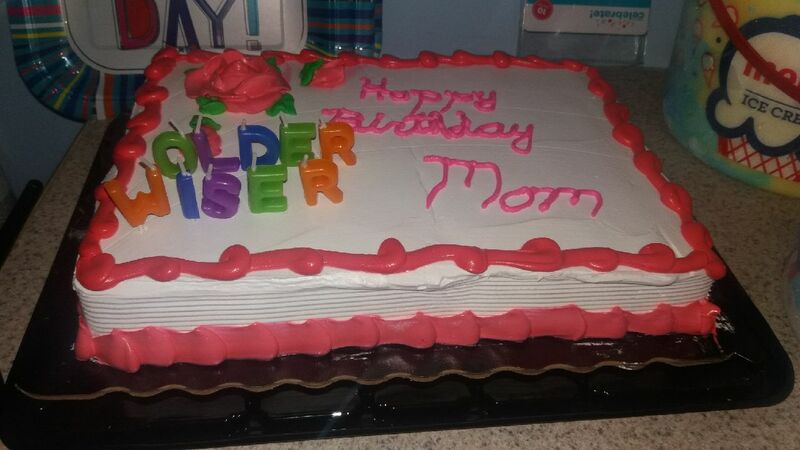 The cake had candles on it that spelled out “older” and “wiser.” Not too sure if the wiser proves true but definitely the older does. It is probably the first birthday I had that even the plates and napkins said “Happy Birthday!” They all helped make a great memorable 47th birthday. We visited and visited. Not so sure if anyone was listening but I do know more than one was talking at the same time. It was fun and we sang a few songs after lunch. Of course we yodeled. My daughters always like when my sisters and I are together and yodel. Was sorry that our two sisters-in-law couldn’t make it for the day. Sister Liz’s granddaughter La Rose and Abigail played together for the first time. It was so cute to watch them play. Sister Liz’s two grandsons were also there and daughter Susan’s baby, Jennifer. The babies had more than enough attention. I appreciate that they all helped make my day special—some traveling two hours to spend the day. I also appreciated all the flowers, cards, and gifts very much. We were shocked to receive the sad news of the death of my husband Joe’s brother Clarence Jr. He was 47 at the time of his death but would be 48 now. We don’t know the cause of death yet but are waiting on the autopsy results. Clarence was never married. He leaves to mourn three brothers, eight sisters, and many nieces and nephews. Once again we are reminded that we do not need to be old to die. In less than four months Joe and I both lost a brother. We question why but take comfort in knowing that God makes no mistakes. Clarence Jr. will be buried in our local Amish community cemetery. Funeral services will be Friday. Son Benjamin will be one of the pallbearers along with eight other nephews. Nephew Henry will also be one of them. It’s a new experience for both of them. In the Amish community the pallbearers help dig the grave. Tomorrow night they will gather at the cemetery to dig the grave for their uncle. Life brings many changes. May we trust in our Heavenly Father for his guiding hand to watch over us as we travel into the unknown future. I wish all of God’s blessings to each and every one of you! I appreciate all the birthday wishes and words of comfort. Take care! Cut asparagus into 2-inch pieces and cook in 1/2 cup boiling water 3–5 minutes until tender. Drain and reserve liquid; set aside. Melt butter in a Dutch oven on medium-high heat. Add onion and sauté 4 minutes until tender. Add flour; cook and stir in reserved liquid until smooth. Add asparagus, milk, salt, and pepper. Bring to a boil. Slowly add sour cream. Allow to cool slightly. Process asparagus mixture in batches in a blender until smooth. Return to Dutch oven to re-warm. Yield: 5 cups. I am sorry to hear about you husband brother,my thought and prayers goes out to all the families. So glad you had a great Birthday with your sisters and daughters. Happy Birthday, Lovina! I wish you many more. Prayers for your family on the loss of both your brother and brother-in-law. God’s timing is perfect, whether we like it or not. I hope the rest of your year is not as eventful. I truly enjoy your writing and your recipes. Thank you for sharing your family and your recipes with us! On behalf of Lovina and the family, these encouraging words are much appreciated. Thanks! Thank you so much, Kim. Very much appreciated. I am very sorry to hear of Joe’s brothers passing. My sincere condolences to your family. God bless you all. Thanks, Dan, I know the family appreciates this.